Every year around the end of October two significant bird events happen at our feeders and both seem to make our customers very happy. First we see less and less Grackles until one day they have all flown south for the winter. Yay! Just as we say goodbye to the large, noisy Grackles, we say welcome back to our delightful Juncos! Double yay! Juncos are small birds in the sparrow family, approximately 5 1/2 - 6 inches long. They nest in coniferous forests with cooler temperatures throughout much of Canada and even Alaska, and at higher elevations in the continental United States. They winter in the United States and Mexico, making them one of the most common birds in North America. There are six varieties of Dark-eyed Junco in North America, but the one most commonly found here is the Slate-colored Junco. Our Juncos are dark grey birds (males slightly darker than females) that look like they’ve been dipped in white paint! If you want to attract Juncos to your yard, try feeding them millet in a tray feeder or let it fall to the ground (they love millet) and sunflower chips. They will also eat nyjer that has fallen to the ground and Bark Butter Bits from a tray feeder. 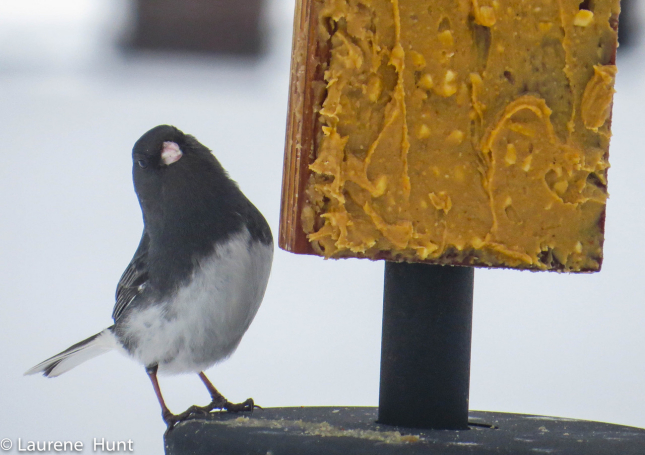 The Junco in our photo is eating organic, salt-free, chunky peanut butter. Lucky Junco!